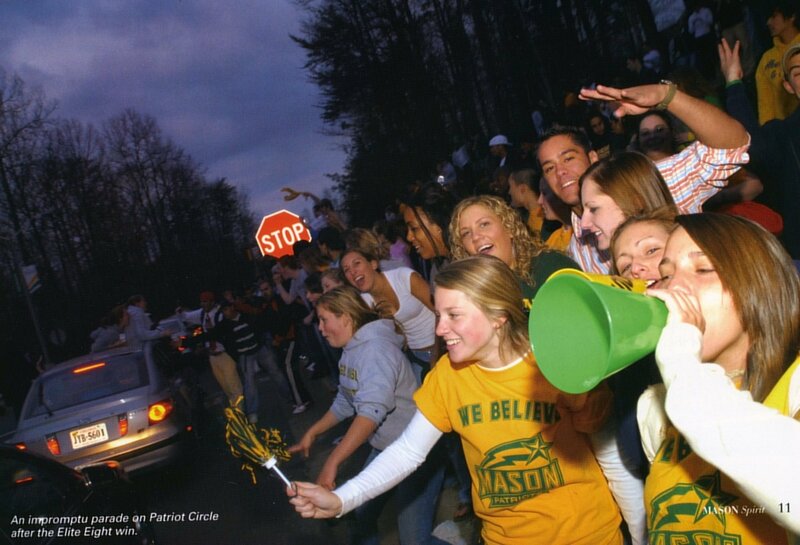 Photograph portrays celebration which took place on Patriot Circle on the Fairfax Campus immediately after George Mason defeated the University of Connecticut at the Verizon Center as part of the Elite Eight round of the 2006 NCAA Tournament on March 26, 2006. This color image was featured in the Spring 2006 issue of The Mason Spirit. Citation: George Mason University, “"An Impromptu Parade On Patriot Circle After the Elite Eight Win." Photograph from Mason Spirit alumni magazine, Spring 2006,” A History of George Mason University, accessed April 21, 2019, http://ahistoryofmason.gmu.edu/items/show/224.